On Sunday we did what we needed to do, at least in terms of the result. A comfortable 3-0 (1-0) win over LeKi-futis means that we are in the driver’s seat on Saturday, when it finally gets decided whether us or NePa get to play for promotion against the second place team from Satakunta Nelonen. We did not quite yet look like a team who is ready for that final big battle, but there was fight and soul in the team that can take us there in the next couple weeks. 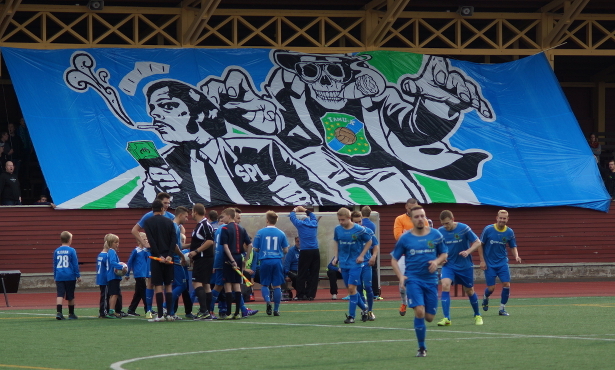 Getting the three points was the main thing anyway – now a tie is enough for us next week away at Tervakosken Pato. I’m sure that we will go for the win, but not actually having to win changes the dynamics of the situation in our favor. Quite frankly, during the first half we did not look like a team that might get promoted. There was a lot of fight in the team, but we were only able to create two chances to score during the whole half. Luckily, the second one went in, a moment of brilliance from Jan Riikonen. He was fighting for a 50-50 ball against LeKi’s ever-loveable number 14 near to upper left corner of LeKi’s box. He won it 100-0 and then moved horizontally towards the middle, fooling another LeKi defender, and then spotter the keeper slightly off his line. A perfect shot to the top right corner was followed by celebrations that showed how much the goal meant for him. Indeed, he had not scored during the past four months or so – great to see Riikonen back on the score sheet. The second half was a bit better from us. LeKi continued to not pose much of a threat irn our end of the field, and goalie Ilkka Innola continued what he did during the first half, picking up the few key saves that were needed. The coaches ended up using all the substitutions, and this time they brought a lot of extra energy and effort onto the field. 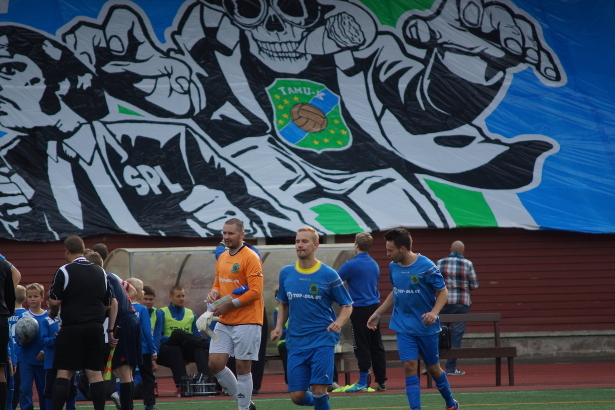 Of the substitutes Mika Kytöviita ended up scoring from the penalty spot and another supporters’ favorite Juha Kumara scored just a couple minutes after coming onto the field. All in all it was a great day out at Pyynikki. Gourmet hot dogs, little boys in blue as ball boys, a nice crowd of 211 people, three points – and best of all, a very successful curtain-type choreo by Sinikaarti. The letters SPL stand for the Finnish Football Association. If you don’t get it, then you don’t get it. On Saturday we will play for a spot in the promotion playoff, which will be played away at either FC Rauma or MuSa/2 (Pori) a week later on either Saturday or Sunday. At the beginning of the season I wrote that my minimum expectation for the season was that relegation never even enters into discussion, and that staying in the promotion race deep into the fall would mark a good season. Here we are on the last week of the regular season and we still dream of getting promoted. Right now nothing less than fulfilling that dream would make anybody satisfied, but looking at the big picture, we have already achieved a lot this season. Now let’s just enjoy the rest of the ride.